The centerpiece of any home movie night is reproducing the theater experience. A good television and sound system are great assets, but so is food that mimics the stuff you can get from the theater … minus the insane cost of movie theater food, of course. Candy and soda are staples at the movies, but nothing is as iconic as, well … you know. Unless you have a dedicated popper, you probably opt for the microwavable stuff. Aldi, like most grocers, offers its own take on that market: Clancy’s Premium Microwave Popcorn is a Regular Buy, and it comes with six packs of those familiar plastic sealed paper bags. Cooking it is absolutely a cinch. Remove the plastic. Unfold the paper bag. Place in the microwave for 1 minute and 45 seconds. Pull out and let cool for a moment. Open the bag. Eat. Easy, right? Beyond that, the box offers a couple of pieces of advice. One, it recommends listening to the popcorn while it pops, and stopping if more than 1-2 seconds go between popcorn pops. (If you’ve made microwave popcorn, you know this is standard procedure.) On the other end, the box notes that if there are too many unpopped kernels left after microwaving, to increase the time with subsequent bags. 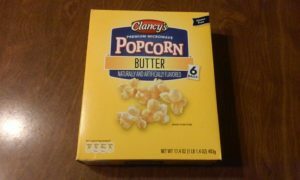 It’s not movie theater butter popcorn, but if you’re looking for standard butter-flavored popcorn that tastes like your typical grocery store microwaveable popcorn, Clancy’s Premium Microwave Popcorn works just fine. The popcorn is very good. But the last time I bought a box of 6, There was only 5 packs in it when I opened it. Remember that Aldi does have a guarantee on its products. You can get a refund and replacement in those instances. Bought a box when I opened the second package there was a large glob of a yellow substance between the folded layers.